Offering and facilitating a book discussion using a form of reciprocal teaching. On December 7, 2017 the TLT Group offered a book discussion for members. 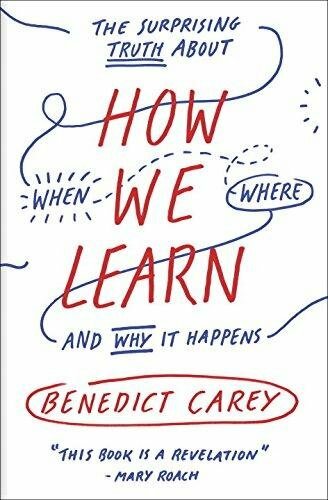 The book, "How We Learn: The Surprising Truth About When, Where, and Why It Happens" by Benedict Carey. I invited TLT Members to chose a chapter in the book to read and then share at least two ideas that were most significant to them. Sharing could take several options: attend the session or submitting a summary in writing or via video or audio. I created a Google doc sign up sheet. "Sign Up for a Chapter." I then prepared a slide representing each chapter using Haiku Deck. The approach was a form of reciprocal teaching in that each person shared information from their chapter. The summaries took different forms, from verbal, to slides, to a document to a audio recording. We had a small group of 7 people and we used ZOOM video conferencing platform to connect. Reading and summarizing one chapter was more manageable. Participants who read one chapter were able to come away with insights from the entire book. Participants who one chapter had more information and then could decide if they wanted to invest more time in reading the entire book or other aspects. We needed a little more time structure to ensure that all chapters were given time. so setting a limit for each chapter would be good. Add a few minutes at the end for debrief, what went well, what could be improved and next steps. Provide more time to promote and describe the expectations in better detail. Decide what book to discuss next by surveying the TLTG Members. See survey below.